Incredible India. That's the slogan of India tourism. Incredible means something that is difficult to be described, amazingly, does not make sense. India is as if tracing tracing wonders. Many amazing destinations. One is the Taj Mahal, in Agra city. The Indians called Monument of Love. Agra was the capital of the Islamic Empire centuries Mughol who ruled India. Empire was founded in 1526 AD to the invaders conquered England in 1857. Taj Mahal is actually building the tomb. 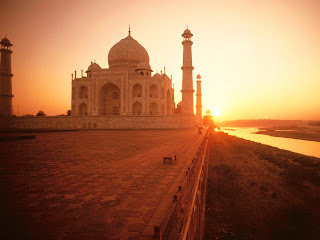 Taj Mahal is remembered as a symbol of love Shan Jehan, the fifth emperor of the dynasty Mughol, his wife, Mumtaz Mahal. Shan Jehan built the Taj Mahal in 1631 for the tomb of Mumtaz. His real name Arjumand Begum, Princess of Persia (Iran). After marriage, Arjumand was named Mumtaz Mahal, which means Jewel Palace. Mumtaz is known for her beauty and attention to the poor. He was the idol of the people. Mumtaz died at the age of 39, when it gave birth to the 14th June 1631. This makes the death of Shah Jehan Empress were so sad. The time is widely used to pray and read the Qur'an at the tomb of Mumtaz. Shah Jehan began construction of the Taj Mahal, six months after Mumtaz's death. Initially, the building was called the Shah Jehan as a 'mosque', where he prayed for the spirits of the Empress. The main building of the dome 57 meters, which is entirely composed of 28 types of marble rock was elected, was completed in 1648. But the entire Taj Mahal complex was built over 22 years. 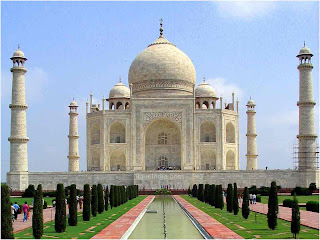 And Taj Mahal become the most popular tourist attractions in India. Unlike other Mughol cemetery, park in front of the Taj Mahal. The background of Taj Mahal is sky, making it look so imposing building with gleaming white marble. Composition of the line shape and perfectly symmetrical. Unfortunately, access to get there pretty hard. Nearest metropolitan city of Agra is New Delhi. The distance is about 200 km. There is a bypass road between New Delhi and Agra. But do not you imagine the main road was smooth. Instead, you'll find a bumpy road, a lot of holes and pools of water, nearly along the path to Agra. But it all paid off when we set foot in the Taj Mahal. It's incredible. Amazing. Pictures of the Taj Mahal in miniature postcards that are sold or there is not enough to describe the legend, poetry, and romatinsme described by poet Rabindranath Tagore as India 'Tear Drops of Love An Emperor' it. You are not perfect in India if it does not visit to the Taj Mahal.